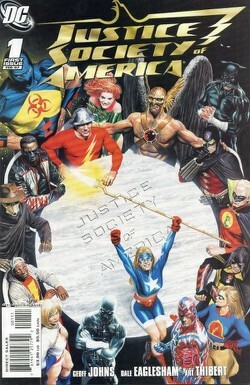 "The Next Age: Chapter One"
We see the JSA lined up in World War 3. Superman, Batman, and Wonder Woman speak with the JSA to find out how to make heroes better. Mr. America describes his start in vigilante life, then comes upon a crime scene. He surveys the scene, describes poisoning, and then removes his mask, revealing that his family has been slain. The JSA ponders its new lineup, Hourman, Mr. Terrific, Power Girl, Liberty Belle, Stargirl, Dr. Mid-Nite, Green Lantern, Flash, and Wildcat. Wildcat declines the opportunity to vette new members. In Philadelphia, police deal with a rampaging villain. Rebel and Damage duke it out, only to have Hourman and Liberty Belle step in and invite Damage into the JSA. Damage declines, originally, then realizes that the destruction he caused fighting Rebel would be paid for when Hourman says to bill the JSA. Reluctantly, he comes along. Mr. America fights Catalyst, who has gone after his brother, now. They fight, and Mr. America starts to get the best of Catalyst. Power Girl and Mr. Terrific find Maxine Hunkel, Ma Hunkel's granddaughter, flying outside of Harvard, where she attends and excels. She appears to be developing tornado powers. They offer her membership, and she goes ape, talking up a storm. In Opal City, Starman saves a helicopter, then flies off, spouting nonsense, apparently insane. Stargirl and Mid-Nite visit Starman in his hospital, and recruit him, after he asks them to help him find his mind. Green Lantern and Flash grab Wildcat and tell him to hurry to their destination. Mr. America waits on a wharf at Catalyst's meeting place for the man who paid Catalyst to kill Mr. America's family. A voice catches his attention. Maxine arrives to find the entire JSA finally gathered. Starman says, "There's a star on Thanagar. I dreamt about it. Ha! 52!" Beaten, staggering, Mr. America runs somewhere, to warn someone that he was just the beginning. He falls into the Justice Society meeting, smashed to hell. Wildcat, meanwhile, meets Tom. His son. A preview page says: "Coming this year in JSA:" and shows Batman meeting with Sandman about seeing Batman's death, Someone who looks like Vixen saying she has to track down Starman. We see Power Girl react in surprise as a hand comes out of Kal-L's grave. Finally, we see the Kingdom Come Superman lamenting that his work never ends. Story - 5: An absolutely brilliant beginning to the next iteration of this already brilliant book. For those of you new to the series, Geoff has been making JSA a kind of unsung hero book for character for quite some time. It's not a comic for people who want instant gratification or overwhelming clich� stereotype, but it is a book for people who like a good, multi-character team drama. It's rife with family, strength, action, and good plots. 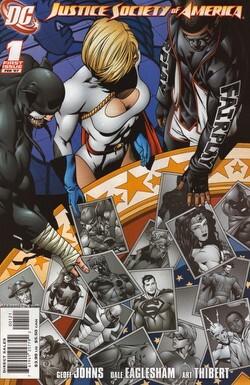 It's like reading a story on a par with Identity Crisis on a regular basis, minus the baggage of the MAIN CHARACTERS. Slowly but surely, this book has been maneuvering into the radar of even casual fans, to the point that now it's going to involve elements like Kal-L, Power Girl's larger part in the universe, and even, it would appear, the Kingdom Come Superman. The book had waned a bit, as it ended. Johns was taken up with Infinite Crisis, and a few of the stories were less entertaining than when he helmed the book as closely. Now, back in action, he opens up with one of the better first issues I've ever read, structurally. All of these characters are classics, but you're also pulled along by Mr. America's dilemma, and wondering how this will harm the JSA. Every character pops, every scene is strong, there's not much to hate here. A killer opener for a strong new book. Art - 5: I like Eaglesham's work when he's doing action, but he's also getting better with regular character interaction as well, as I experience him. Good stuff. Mr. America's beating, his landing on the table, the WW3 spread, all incredible. I haven't got much to say, mostly because I'm greatly pleased.